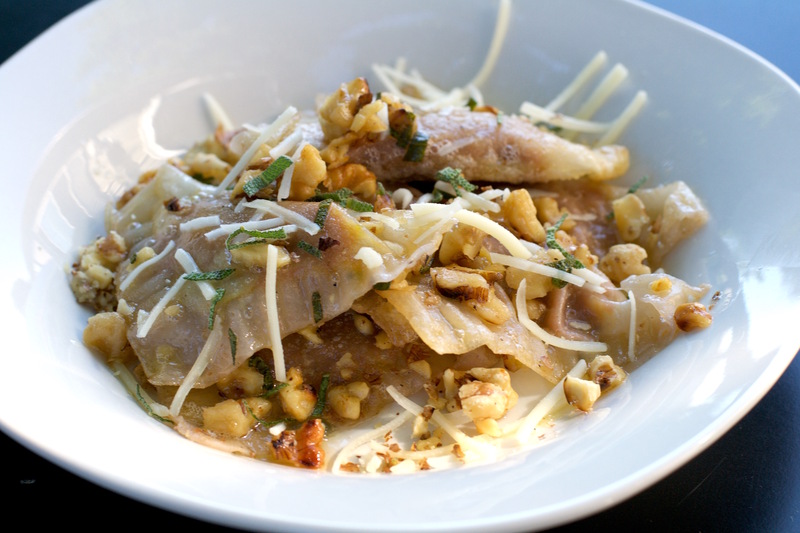 Pumpkin Ravioli - What the Forks for Dinner? Does anything say fall more than pumpkin????? I think not…….But Pumpkin Ravioli says it best!! 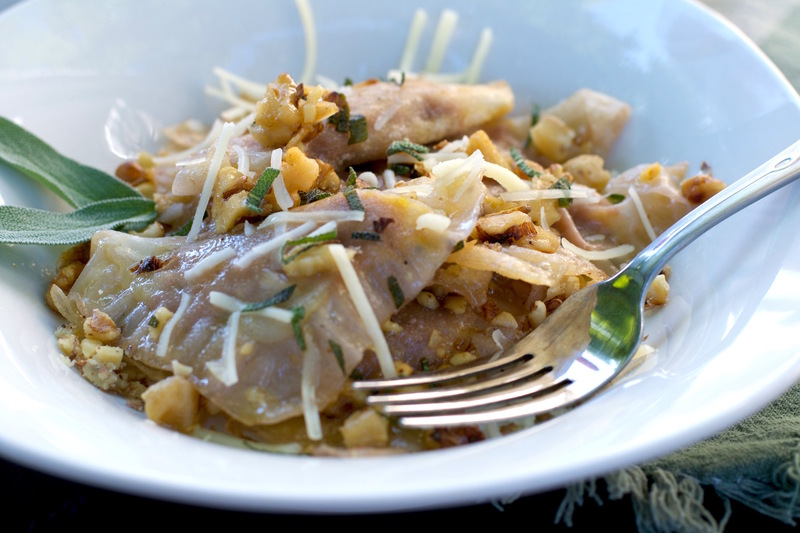 Easy to make, using wonton wrappers instead of making pasta, filling from canned pumpkin, a touch of sage and walnuts ………yummm! I have always loved pasta. I could eat it everyday. There is something heart warming and hearty about a pasta dish. I had never really thought of pumpkin with pasta, but you use squash, so why not pumpkin?? No reason what so ever……here we go. Just a can of pumpkin, not pie filling, just regular pumpkin. Mix it with some grated nutmeg, buy the nuts and grate it yourself, you will not be sorry. A touch of parmesan and walnuts. A quick mix and ooh la la.. filling. Wonton wrappers are a perfect faux pasta. Just fill, fold, and boil. It takes just minutes. I had a skillet with butter over a low heat waiting to bathe the ravioli in its lusciousness. Add in some walnut and sage, give it a toss. Plate and serve with extra, walnut, sage and parmesan cheese. 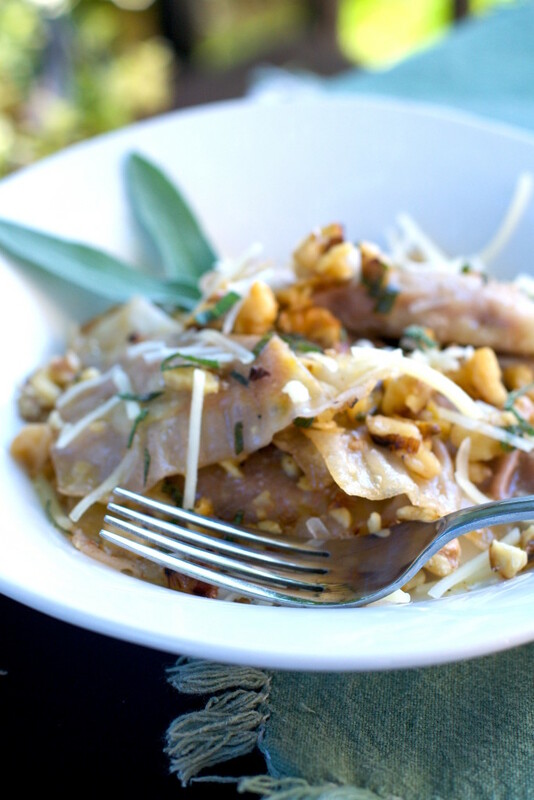 The perfect fast and easy fall pasta…..Pumpkin Ravioli! Place the canned pumpkin in a bowl. Add nutmeg, walnuts, Parmesan cheese, 1/4 teaspoon of salt, and 1/4 teaspoon of black pepper, and mix well. Using the tip of your finger, moisten the edges of the wrapper with a dab of water. Fold wrapper over (forming a triangle) and press down the edges with your fingertips and the tines of a fork. Place the finished ravioli on a cookie sheet lined with parchment paper sprayed with non stick cooking spray. Add a teaspoon of oil to a 6-quart pot of water and bring to a boil. Add the ravioli to boiling water and cook for 1 minute. Remove from water and place in skillet of warm butter. Continue with remaining ravioli adding to butter.Add the sage and pinch of salt and pepper. Toss gently to coat ravioli with butter sauce.